I've been looking for a perfect neon beanie for quite some time now, but since I decided I wanted the yellow neon one, I soon gave up on looking. Until I came across this one that caught me completely unprepared, on a day when I made a quick stop at H&M, to pick up nothing but a set of bobby pins. But to be honest, going to a store like this, I don't seem to be able to leave with only one (basic) item and since I realized I can't wait for my yellow neon beanie any longer, the pink one would do! Have a great rest of the day everyone! love it , like it ! Great look. Love the beanie. 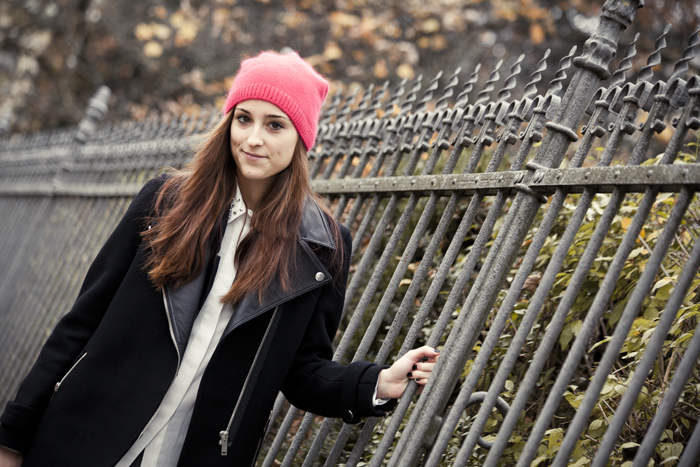 Neon beanie is a must have for this winter! LOVE it. I have one from last year and am still obsessed. I love the whole concept for your look. aaw i love your outfit! all black with a flash of color! Love the mix of dark colours and a touch of neon. It's a great outfit and i love Your beanie! This neon touch is so pretty. I love your beanie so much!! I love the pop of pink with the hat - you look fab!